Excess nutrients entering a river, lake or ocean is classic example of too much of a good thing. In addition to disease and toxins, untreated waste water carries the same nutrients found in plant fertilizer. These nutrients can trigger the explosive growth of algae, which can suffocate surrounding fish and invertebrate life or even secrete toxins that threaten to poison entire food systems. Clearly, microbes are at the crux of the problem, but containerized MBRs and MBBRs turn microbes into a mobile water treatment solution. Left: Microscopic Psuedo-nitzchia algae secrete neurotoxins that put human health and marine life at risk. Oregon State University. 2017. CC BY-SA 2.0. Right: Heavy nutrient pollution has left the reeking Chao Lake unfit for fish and drinking water. Man at Choa Lake, China, Green Peace China. 2008. CC BY 2.0. MBR and MBBR plants use bacteria to pre-digest the nutrients. Biological water treatment is a bit like a factory, except instead of assembling a product, each station strips nutrients to simpler and simpler parts. Once the bacteria sufficiently digest the nutrients, the discharge can enter a water system without triggering an algae bloom. Biological treatment can be self-contained in a series of vats, but it still calls for climate control and protection. Shipping container shelters protect delicate biological processes while preserving the small-foot print and modularity of MBR and MBBR plants. In an MBR system, the digested water passes through a submerged filter with microscopic pores. For perspective, roughly 2000 of these pores could fit across the diameter of a human hair. Most of the bacteria are too large to pass through the filter. In an MBR water treatment system, bacteria digest nutrients in waste water, as clean water passes through a filtration membrane with microscopic pores. A complete MBR system including the tanks, air blowers, filtration, and vacuums can fit in a shelter made from two 40-foot shipping containers. The fast-installation of a containerized MBR plant can help a time-pressed community expand their water treatment capacity just days after the unit arrives. MBR treated water is not considered potable (disinfection is needed for viruses), but the treated water is clean enough for discharge, irrigation, industrial cooling, and toilet water. 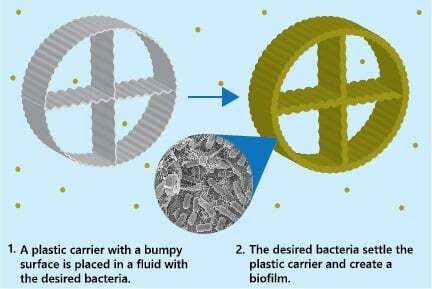 In MBBR plants, the bacteria form mat-like colonies, called biofilms, on cart wheel shaped pieces of plastic about the size of a nickel. Infographic created by Falcon Structures. Bacteria image courtesy of the Lewis Lab at Northeastern University. Image created by Anthony D'Onofrio, William H. Fowle, Eric J. Stewart and Kim Lewis. Unlike MBR systems, there is no microscopic filtration in an MBBR system. Instead, the biofilm-laden carriers circulate through a tank with the help of either a pump or bubbler and eat the nutrients. Generally, municipalities use MBBRs as a phase in a larger water treatment operation or industrial businesses use MBBRs as a fast treatment option when environmental regulations allow. They are particularly popular options for treating the waste water associated with industrial food and beverage processing and landfill leachate. If a regulatory body mandates an organization treat their waste water, a shipping container-based MBBR plant can arrive onsite in around two months—far faster than excavating and building a plant with traditional treatment ponds. In our years of experience, we’ve found that shipping containers are a sensible option for almost any industry that needs a durable modular space. 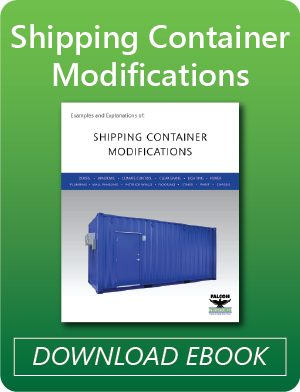 It speaks to the versatility of containers to see how a few modifications can make a container into a cozy workspace for people or bacteria, the water treatment industries tiniest team members. If you would like to containerize your equipment, give us a call at 877-704-0177 or email us at sales@falconstructures.org.